Entry on Saturday from 3.00pm, departure on Saturday by 11.00am (or at other times to suit all parties – by prior arrangement only). Above rate is inclusive of bed linen, towels, electricity, peat and logs and internet access. 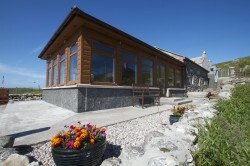 Short Breaks @ £130/night (minimum of a 3 night stay). This is based on 3 consecutive nights taken within a Saturday to Saturday letting week. Special offers are available between October and March.